The SR-71 Blackbird remains an icon of American aerospace engineering to this day. Its speed and operating ceiling are unrivaled. 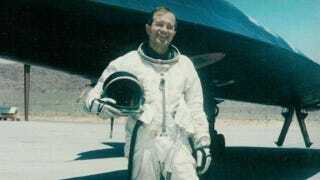 However, it did not simply spring forth fully-formed from the head of "Kelly" Johnson—it spent years in development as the A-12 Oxcart being flown by an elite group of Air Force pilots. Colonel Ken "DUTCH 21" Collins (ret.) was among that cadre. He spoke to Gizmodo about his experience, and he joins in a live chat today at 1230 EST / 0930 PAC to talk to you. Gizmodo: Can you give the readers a brief background as to how you were selected into the Oxcart/Black Shield Program? Col. Collins: I began my pilot training in 1951, got commissioned in February 1952, and went through jet training in the first Air Force jet, the F-80. In August of that year, I was in Korea, flying combat missions. You had to fly a hundred missions and most everybody got more than that. I flew 113 over North Korea, some even up into Manchuria. In 1955, I went to Germany as an instructor pilot at Spangdahlem in Western Germany. Then I came back in 1959, to South Carolina to Shaw AFB and flew the F-101. I was being considered for a classified program at the time, which turned out to be the Oxcart program. I was up in Area 51, not that far from where I am now in the San Fernando Valley. I was in North Ridge, and every Monday I drove to Burbank where we flew out of Lockheed's private air strip to get to Area 51. Everybody from the maintenance guys to the pilots to the engineers all flew out of Burbank for the duration of the experimental phase of the A-12. And then in '68, we got operational and were deployed to Okinawa. When we were there, we had two pilots, though there were six of us at the time for Operation Black Shield. We flew out of there for six weeks at a time—one guy would rotate out and another would come in. We kept that rotation up for a year. These were combat missions. This was the first Mach 3, 80,000 foot, combat mission flown in the history of aviation. We flew over North Vietnam and North Korea. Finally, the Air Force said that the CIA wasn't supposed to be flying planes anyway. Gizmodo: Can you tell me about any particular mission that really stood out for you? Col. Collins: Well, the missions were pretty standard, because, to get to North Vietnam you always went in over Hai Feng harbor over Hanoi. And to do that, we'd take off from Okinawa and refuel shortly after. We learned early on that you didn't take off with a full fuel load because there was so much wear and tear and heat on the wheels. There were great big fans we had to put down next to the wheel after a landing. If it hadn't been for the A-12, there wouldn't be an SR-71. They both used the same engine, the J-15, which was an amazing engine. We took off from Okinawa, refueled 15 minutes after takeoff, and we headed down north of the Philippines and then we'd make a left over Hai Feng Harbor, over Hanoi, probably crossing a bit over Laos, and then we'd descend in and refuel again just east of Bangkok. And then we'd travel out along a slightly different route for full photo coverage. The missions were about six hours apiece. I think we flew three or four missions up there in North Korea [during the USS Pueblo crisis]. And we were there for that year until 1968, when replaced our entire facility—and the entire thing was turned over to the Air Force from the CIA. We had the option to go where we wanted to go, at the time the program was a big consideration for Air Defense Command. I made the decision to go to Beale AFB and fly the SR-71. I was there from '68 to '74 flying the SR, mostly as an instructor and as a staff officer. Gizmodo: You mentioned previously that you very much preferred the A-12 over the SR-71. Why is that? Col. Collins: Well, it flew a little higher, and had a better center of gravity, and didn't have a guy in the back seat. It was just a good airplane, and didn't leak as much. It didn't have a sealant problem. [Fuel tanks 6A and 6B in the SR71 were notorious for leaking fuel, which doubled as the plane's in-flight lubricant]. Both of them were great airplanes. I didn't turn down the opportunity to fly the SR-71 again by any means. The only guy that bailed out at high altitudes (over 80,000 feet) was Bill Weaver, a test pilot. He had a flight engineer in the back seat. They had an engine non-start in the left engine during a big right turn, which caused the plane to start tumbling apart. That's because it was an SR-71 and it had an aft CG and it didn't have enough stick authority to get the nose up quick enough. The guy in the back seat was killed from the ejection. Gizmodo: Can you tell us a bit about your crash in Wendover, UT? Col. Collins: I was flying with the J58 engine before it was officially approved to Mach 3, for some subsonic, low-altitude engine testing. A pilot named Jack Weeks was flying chase behind me in the F-101. I was in a standard flight suit (we didn't go above 50k feet during testing so we didn't need to wear the full pressure suit that we normally use). So I was doing all the engine testing and checking, taking the indications of what we had, and we had a recorder on board. So we made a turn back during the return, we turned south back towards Area 51 and got into some weather at 30,000 feet. The instruments were normal, they were just sitting there—both the engine and aeronautics instruments. Jack says, "You're slowing down, I can't stay up with you." And he's in this weather so he moves off, pulls away to the south. I look at it, and pretty soon my flight instruments start unwinding, my airspeed and altimeter. I thought that was strange, so during a debriefing with Kelly Johnson, he asked me, "What was the last air speed you saw?" and I said "102 knots," and he says, "that's when it'll pitch up" and that's exactly what it did. It pitched up, and it inverted into a spin that you can't recover from. I figured it was time to get out. So I ejected downward and got out of the weather before my seat separated. I look up, see my parachute, and say to myself, "That's good." So I start looking down at the ground thinking about where I'm going to land when, all of a sudden, that chute separates. Now I didn't know why it separated but I knew it was bad news. What it was, was the high altitude parachute that had deployed and that's what I was looking at first. Then, at 15,000 feet, it separated automatically before the main 35-foot chute opens. It's a damn good thing it opened up. So I land, and start rolling up my chute and collect my stuff, because I had no radio communications with anyone. I knew they'd be looking for me somewhere but I figured I was going to have to sleep in that chute. But three guys in a pickup truck come bouncing across the desert just west of Salt Lake and they said they'd offered me a lift back to my plane. I said, "Well, that's an F-105 (that was our story and this is in May of '63), and there's a nuclear weapon on board." And they say, "Well you better get in here then, 'cause we're leaving." They already had stowed my canopy in the bed of the truck so I toss my parachute in there too and they drove me to a nearby highway patrol substation just outside of Wendover. I made a phone call, and the next thing you know, there was an airfield there. The CIA took me and the plane back to Albuquerque, NM, to the Lovelace medical facility (where actually all the astronauts and U2 pilots went) for a check out before heading back to Burbank. Have a question for the Colonel? Ask it below. He will join our discussion at 12:30 pm EST. Update: The Q&A is now closed. Thank you all for your questions and a special thanks to Colonel Collins for taking the time to speak with us today.